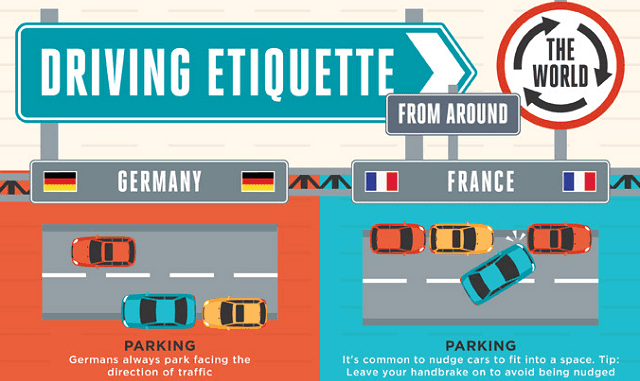 Driving Etiquette Around the World #Infographic ~ Visualistan '+g+"
Driving a car in a foreign country can be very daunting. Not only do you have to abide by that country’s different road laws and rules, but also its unwritten rules and cultural etiquette, which although unofficial, locals often uphold with even more vigour than the law. For example, did you know that in France, it is common to budge other cars out of the way in order to park? Or in Germany, everyone parks facing the same direction? Or that in Switzerland it is actually illegal to wash your car on a Sunday? iCarhireinsurance researched driving rules and regulations across 6 different countries, as well as some of the more eyebrow raising driving customs from around the world, and visualised it in an easy to digest guide so travellers planning on driving abroad can avoid upsetting the locals, not to mention expensive fines and even stints in a cell.